Vuzix demoed the latest addition to its video eyewear range at the Games Developers' Conference in San Francisco this week. 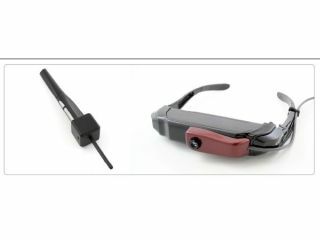 The AR Accessory Kit works with your existing Vuzix glasses and consists of two main features. The first is CamAR, which is a clip-on USB camera that mounts onto a pair of Vuzix Video iWear. According to Vuzix, the CamAR is "designed to accurately track objects and the user's position in three-dimensional space." The second add-on is PhasAR. This is a "wireless augmented reality input controller". Cutting through the techno-babble, this essentially is a 'magic wand' that lets you control 3D objects in the virtual space. The demo shown at GDC: 2009 consisted of a printed page being brought to life with 3D animated characters that popped out of the book, all courtesy of the AR Accessory Kit. "This capability, known as Augmented Reality (AR), will open up new applications in the gaming, education and business sectors," said Vuzix CEO, Paul Travers. "The applications for gaming and education will range from books that come alive to interactive worlds with 3D characters that materialise right in your living room." TechRadar is hoping to grab a hands-on (eyes-on?) when the headset is unveiled at The Gadget Show Live UK in April. Although no release date has been announced, we contacted Vuzix and they told us that the accessory kit should be on the market for around £80. But this price is subject to change.